A cornucopia holds food and gifts. It is shaped like a horn. Many people use it to decorate in the fall! It reminds them of all the good things they have, even if they had a hard year. God gives us so many blessings. Friends, family, yummy food, and furry animals are all gifts from God! This year, remember to thank God for all His gifts. Then make a fruit-stuffed cornucopia! This easy snack recipe is great to make with your friends and family! Dip the top edge of the waffle cones into the chocolate. You can dip the cone in a little way, or just cover the edge. The amount is up to you! Set your waffle cones on a plate. Put them in the fridge. Then, take out your fruit and wash it. *Ask a grown-up to help cut fruit! 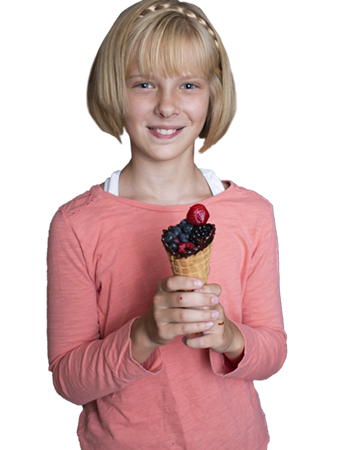 When the fruit is ready, take the waffle cones out of the fridge. Carefully fill the cones with fruit. Start with small berries that will fit in the cone. *Sparkle Tip: Put a spoonful of chocolate at the bottom of your cone! Then you can end with something sweet! Have your friends or family help fill the rest! Then share something you’re thankful for this year.